Fashionable Tall Boots - with Stretch! 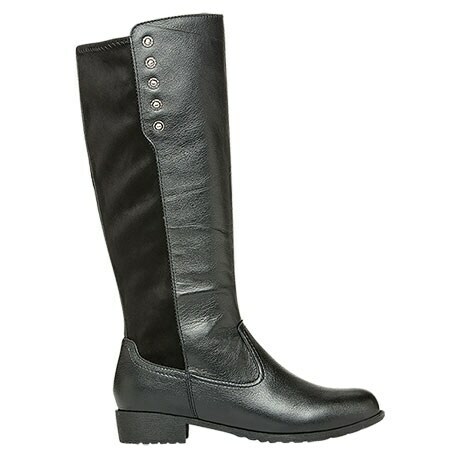 Full leather tall boots with fun and functional stretch ankle to top of calf that helps accommodate different calf sizes and stretch throughout the day. Treated with Scotchguard® to help repel water. Full zipper for easy on and off. Rubber outsole for improved traction and padded insole for comfort. Shaft circumference 16". Designed by a renown podiatrist, this system was clinically tested for comfort, pain, and energy while walking. The results? The testers found they could spend more time on their feet, reduce pain and discomfort from the arch all the way to the lower back, and less muscle strain while walking. Why? They cup the heel to help maintain correct alignment and gait, thus reducing pain and discomfort with every step. Rejuve Motion Technology™ has revolutionized the way you walk.